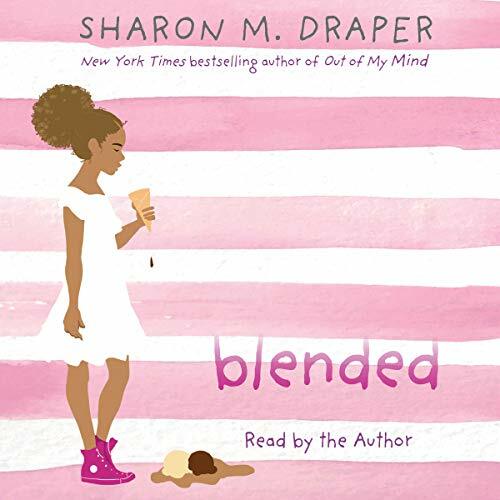 Eleven-year-old Isabella’s blended family is more divided than ever in this thoughtful story about divorce and racial identity from the award-winning and New York Times best-selling author of Out of My Mind, Sharon M. Draper. Eleven-year-old Isabella’s parents are divorced, so she has to switch lives every week: One week she’s Isabella with her dad, his girlfriend Anastasia, and her son, Darren, living in a fancy house where they are one of the only black families in the neighborhood. The next week she’s Izzy with her mom and her boyfriend, John-Mark, in a small, not-so-fancy house that she loves. Because of this, Isabella has always felt pulled between two worlds. And now that her parents are divorced, it seems their fights are even worse, and they’re always about her. Isabella feels even more stuck in the middle, split and divided between them, than ever. And she’s is beginning to realize that being split between Mom and Dad is more than switching houses, switching nicknames, switching backpacks: It’s also about switching identities. Her dad is black, her mom is white, and strangers are always commenting: “You’re so exotic!” “You look so unusual.” “But what are you really?” She knows what they’re really saying: “You don’t look like your parents.” “You’re different.” “What race are you really?” And when her parents, who both get engaged at the same time, get in their biggest fight ever, Isabella doesn’t just feel divided, she feels ripped in two. What does it mean to be half white or half black? To belong to half mom and half dad? And if you’re only seen as half of this and half of that, how can you ever feel whole? It seems like nothing can bring Isabella’s family together again - until the worst happens. Isabella and Darren are stopped by the police. A cell phone is mistaken for a gun. And shots are fired. The narrator's voice is too seasoned to convincingly narrate the story of a young girl. I love Sharon Drapers books! But she should have hired a professional to read her book. It just didn’t feel authentic to have an older woman read a book that was narrated by a young girl. Honest look at a girl split two ways, the issues feel realistic. Isabella is 11, a talented pianist and caught between two lives - her white mother and boyfriend, and black father and his girlfriend. Since their acrimonious split, Isabella divides her time equally between 'Mom's Week' and 'Dad's Week', though at the same school, and feels, as a mixed race adolescent, a little conflicted. Neither house is 'home', though both parents are adoring, both partners incredibly welcoming and loving (a little unrealistically so). Her dual life is making her feel pulled in half, not just in terms of her time... Who is she really? With issues regarding race cropping up and school, when shopping, Isabella speaks to us about her identity issues, questions and thoughts many young people will have had. It is only near the end of the book that a sledgehammer rocks Isabella's world, and a final dramatic bolt from the blue gives Isabella's life(lives) a kick and pulls the threads together. It's hard not to like Izzy and feel for her in her situation, even if you aren't going through something similar. She's musically talented, bright, with a future. Her story gives plenty of food for thought. One aspect I wasn't sure of at the start was the author's decision to narrate herself. I felt the narrator sounded a little 'mature' for the voice of the 11-year old Isabella, but I did grow more accustomed to it and also felt her voice sounded a little younger as the book went on, more suited to the age of the protagonist. The story itself is a straightforward Audible 'listen', and at only 6 hours, a quick book to access via the ear. It was not a problem following, and the author did find different voices for all the characters. A few plot points felt tacked on/sudden, but the general direction of the story and major topics under discussion were well handled, with a personable lead that readers will sympathise with.